Situated with Greg in our Torrance, California office, Maria offers vital assistance in assuring the smooth operation of the Torrance back office. 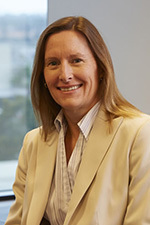 She carries FINRA Series 7 and 66 licenses and has a BS degree in biology from the University of California, Davis. Maria understands the complexities associated with clients’ various wealth management accounts, trusts, retirement plans, college savings plans and the special requirements of non-profits. Creating solutions for the detail, scheduling and communications challenges that inevitably arise from such programs and paperwork is a regular occurrence, masterfully handled by Maria. She honed her skills of practicing clear, real-time communication and execution in complex situations when she was the women’s soccer coach at Fairfield University. “Coaching in a Division 1 setting forces you to stay cool under pressure,” she explains. “You keep your eye on the overarching goal, not just one play. And you don’t respond to unproven methods. Instead, you stay within your discipline and do what works.” Through her coaching experience, Maria also has developed uncommon expertise in the dynamics that make a team function as a single unit with a common goal. At home, as in the office, she doesn’t like to sit still: Maria is an avid weekend triathlete.